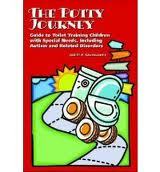 The Potty Journey: Guide to Toilet Training Children with Special Needs, Including Autism and Related Disorders By Judith A. Coucouvanis. Using a no-nonsense, often humorous approach, Judith Coucouvanis, MA, APRN, BC, shares strategies that have produced remarkable results for parents of children with autism and related disorders nationwide. Promising no “quick fixes,” The Potty Journey systematically guides you through the entire toileting journey, step-by-step, to the ultimate destination – dry pants. Pp.148. This entry was posted in Child Development, Our Library and tagged Autism Spectrum Disorder, books. Bookmark the permalink.